To demonstrate the equality between men and women at the level of rewards for good deeds, Allah says in His Glorious: "For Muslim men and women,- for believing men and women, for devout men and women, for true men and women, for men and women who are patient and constant, for men and women who humble themselves, for men and women who give in Charity, for men and women who fast (and deny themselves), for men and women who guard their chastity, and for men and women who engage much in Allah's praise, for them has Allah prepared forgiveness and great reward." (33:35). If the woman was in a status lower than that of the man, she would not have gained the same reward. Moreover, Allah judges humans in accordance to their intellectual level. Had the woman been considered less intellectually competent than the man, her judgment would not have been as his, which confirms their equality in accordance to their mental potentials. In addition, we notice that when Allah mentions an example on the believing men and women, considering that this example talks about the human that embodies the thought, be it negative or positive…we notice that He is actually giving an example on the disbelieving men and women, represented in two types of women. Concerning the negative type, He says: "Allah sets forth an example to those who disbelieve the wife of Nuh and the wife of Lut: they were both under two of Our righteous servants, but they acted treacherously towards them so they availed them naught against Allah, and it was said: Enter both the fire with those who enter." (66:10). As for the positive type: "And Allah sets forth an example to those who believe the wife of Firon when she said: My Lord! Build for me a house with Thee in the garden and deliver me from Firon and his doing, and deliver me from the unjust people." (66:11). Actually, He had set forth Firon's wife as an example of a believing woman who rejoices in the ability of refusing the entire world for the sake of Allah and the Hereafter, so as to be a role model for both men and women. 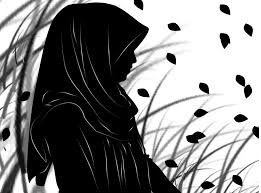 This woman abandoned all wealth, power, and fortunes, because she refused to live with a disbeliever and all she asked for was to win Allah's content so that He makes heaven her abode. There is nothing greater than a mind that is perfectly capable of weighing all the negative and positive aspects, as well as the consequences of both. Moreover, this woman actually practiced what she preached, and her decision to refuse the entire world for the sake of all governed her entire life. In another verse, Allah says: "And Mariam, the daughter of Imran, who guarded her chastity, so We breathed into her of Our inspiration and she accepted the truth of the words of her Lord and His books, and she was of, the obedient ones." (66:12). Allah is actually talking about Lady Mary (a.s.) who represents the most sublime and elevated example of a believing human being. Thus, singled her out among the women of the world, and the Angels talked to her: "O Mary! worship Thy Lord devoutly: Prostrate thyself, and bow down (in prayer) with those who bow down." (03:43), and: "To the care of Zakariya was she assigned. Every time that he entered (Her) chamber to see her, He found her supplied with sustenance." (03:37). Lady Mary is a woman that went through one of the cruelest experiences, yet she managed to overcome them. Therefore, Allah calls on all believing men and women to look up to her, for she was the role model of piety and commitment, and believing in Allah's Book, as well as the model of submission and obedience and commitment to Him. The Holy Quran also mentions the story of the queen of Sheba who was a disbeliever and whose people worshipped the sun; and the hoopoe, that was one of Solomon's soldiers came and reported what it had seen in the mission assigned to it by Solomon, and it said: "Surely I found a woman ruling over them, and she has been given abundance and she has a mighty throne: I found her and her people adoring the sun instead of Allah, and the Shaitan has made their deeds fair-seeming to them and thus turned them from the way, so they do not go aright." (27: 23-24). i.e. a woman, along with her people were worshipping the sun and following the path of Satan in everything they did; a woman that possessed a lot of money and extraordinary status and potentials, and a big throne to sit on when she rules among the people. The Quran rejects disbelief, disobeying Allah and ascribing partners to Him in its won style, for Allah says: "(Kept them away from the Path), that they should not worship Allah, Who brings to light what is hidden in the heavens and the earth, and knows what ye hide and what ye reveal. Allah! - There is no god but He! - Lord of the Throne Supreme!" (27: 25-26). The Quran, in its own way, works on disturbing the negative thoughts in the human mind. The Quranic style handles this issue from several angles that talk about the nature of this negative phenomenon, for Allah says: "(Solomon) said: "Soon shall we see whether thou hast told the truth or lied! Go thou, with this letter of mine, and deliver it to them: then draw back from them, and (wait to) see what answer they return." (27:27-28), that is, go to them and deliver the message as a mailman does, and meet none of them and throw it where they are sitting. Once she received the letter and read it, how did she react? "(The queen) said: "Ye chiefs! Here is delivered to me a letter worthy of respect," (27:29), so she embarked on counseling and deliberating with them over this issue, for she felt that he who sent the message is a special person: "It is from Solomon, and is (as follows): 'In the name of Allah, Most Gracious, Most Merciful: Be ye not arrogant against me, but come to me in submission (to the true Religion)." (27: 30-31), surely submitting to Allah, the Almighty, or His power that is the power of the right and faith. "She said: "Ye chiefs! Advise me in (this) my affair: no affair have I decided except in your presence." (27: 32), i.e. until you make up your minds, since you are the elite. Apparently, the people used not to think with their minds, for they considered that their role was that of defending the queen and the state against the aggressors. She wanted them to use the muscles of their brains, but they moved those of their arms: "They said: "We are endued with strength, and given to vehement war: but the command is with thee; so consider what thou wilt command." (27: 33), when she found out that there was no use in consulting them, she set up her mind to take a decision: "She said: "Kings, when they enter a country, despoil it, and make the noblest of its people its meanest thus do they behave.But I am going to send him a present, and (wait) to see with what (answer) return (my) ambassadors." (27: 34-35). That person is either a king or a prophet; if he were a king, he would accept the gift for he would consider it a kind of reconciliation or submission; in this way, we could avoid his problem. However, if he was a prophet, he would not want to dominate over our country and king, he would want to gain control over our minds, so as to worship Allah, the Lord of the Worlds, and not the sun: "Now when (the envoy) came to Solomon, he said: "Will ye give me abundance in wealth? But that which Allah has given me is better than that which He has given you! Nay it is ye who rejoice in your gift! "Go back to them, and be sure we shall come to them with such hosts as they will never be able to meet: We shall expel them from there in disgrace, and they will feel humbled (indeed)." (27: 36-37). Eventually, she felt that the threat was serious, so she came with her people to Solomon and she spoke with him. He proved to her that worshipping the sun is nothing more than a myth, and called on her to worship Allah, and so she did having thought profoundly of what he was asking her to do: "She said: "O my Lord! I have indeed wronged my soul: I do (now) submit (in Islam), with Solomon, to the Lord of the Worlds." (27:44). This model demonstrates to us that there are women who are wiser and more rational than men, for she wanted the men of her people to engage with her in thinking and finding a solution for the new problem that contained threats and danger. Actually, they gave her no idea; it was she who proposed the idea, it was she who set the plan, and it was she who was eventually convinced with what Solomon (a.s.) has proposed. If the woman was as inferior as some might say, why would Allah present to us this example of the woman who is more rational and wiser than men?! Based on that, we express our reservations on the idea that the Islamic jurisprudence has been used to, which says that the woman is not qualified for leadership, based on a weak Shiite tradition that quotes the Prophet (p.) as saying: "People ruled by a woman will never be successful."